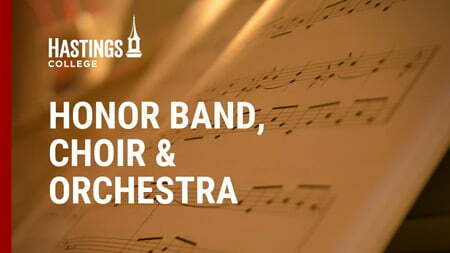 Hastings College will hold its 56th Annual Honor Band, 49th Annual Honor Choir and 40th Annual Honor Orchestra on campus January 31- February 2. The final concert, which is open to the public, will be Saturday, February 2 at 3:00 p.m. in Kiewit Gymnasium (715 E 7th Street). Tickets for the concert are available at the door at a cost of $8.00 for adults and $5.00 for students. The Hastings College Honor Band, Orchestra and Choir (HBOC) are the longest-running high school music honor ensembles sponsored by a college in Nebraska and feature some of the best high school musical talent throughout the region. This year, student participants represented 37 high schools in Nebraska and Colorado. The honor band is directed by Dr. Jason Rinehart, associate director of bands at the University of South Alabama; the orchestra is directed by Dr. Stephan Beham of Duquesne University; and the choir is directed by Dr. Fritz Mountford from Hastings College’s Department of Music and Theatre. Students participating in this year’s Hastings College Honor Band, Orchestra and Choir are listed below, by high school.